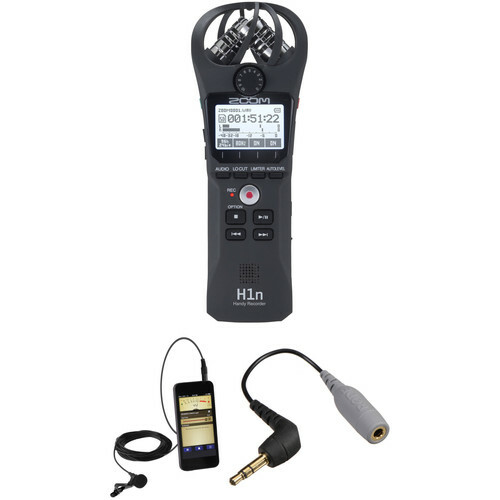 The B&H H1n Handy Recorder & Lavalier Microphone Kit includes the Zoom H1n Handy Recorder with two AAA batteries, an omnidirectional lavalier microphone with a 12' cable, windscreen, tie clip, and carrying pouch, and a 3.5mm TRRS to TRS adapter. With the ability to record the integrated X/Y stereo mic configuration or the external omni mic in MP3 or WAV format to microSD or microSDHC cards, this kit is ideal for mobile journalists, filmmakers, sound designers, and social media content creators. The versatile lavalier mic features a TRRS connection for smartphone compatibility and will record to the H1n with the supplied TRS adapter. An array of other features including a built-in limiter and low-cut filter, USB 2.0 connectivity and audio interface functionality, overdubbing, and simplified synchronization of external equipment delivers versatility and user-friendly operations. Like its predecessor, the black H1n Handy Recorder from Zoom is an easy-to-use, versatile stereo digital audio recorder that fits into the palm of your hand. However, in this iteration, Zoom has incorporated several features to make operation even simpler. Whereas the Zoom H1 featured a single record button on the front of the recorder and a whole array of buttons along the side designed for play/pause, rewind/fast forward, and diving into menus, the H1n features buttons where you can easily see them, on the front of the recorder. Now you can go from recording to pausing, and from stopping to navigating between tracks, all with your thumb. Also provided are four buttons above the record function that let you change the sample rate and resolution, apply a low-cut filter for mitigating rumble, turn the built-in limiter on and off, and enact the auto-level function, which automatically sets the gain for you. The H1n is geared for musicians, journalists, podcasters, and more, recording WAV and MP3 files to meet your professional needs. The H1n has a stereo X/Y microphone configuration that captures a realistic stereo image. The unit records audio to microSD or microSDHC flash memory cards, supporting capacities up to 32GB. The H1n records WAV audio at rates up to 24-bit / 96 kHz, and MP3 audio at rates up to 320 kbps. The pocket-sized device runs on two AAA batteries, providing up to 10 hours of continuous operation. A 3.5mm mic/line input lets you connect an external microphone or line-output source, while a 3.5mm headphone/line output lets you connect your favorite headphones or small external speakers. A high-speed USB 2.0 port allows you to easily transfer data to your Mac or Windows computer. The unit also functions as an audio interface, allowing you to record directly from the Zoom H1n to your favorite DAW. 2 AAA batteries are included. The recorder can record WAV (BWF) files at up to 24-bit / 96 kHz or MP3 files up to 320 kbps and VBR. Broadcast Wave Format allows you to add track markers to your recording. The X/Y stereo microphone configuration captures crisp, true stereo recordings accurately and realistically. The H1n records to easily found microSD and microSDHC memory cards with capacities up to 32GB. The simple interface provides 1-button recording and offers physical controls for playback functions, input and volume levels, low-cut filter, and auto-level control—eliminating the need for complicated menus. A standard 3.5mm mic/line input lets you connect external microphones and sound sources such as MP3 players, while a 3.5mm headphone/line output lets you connect headphones or small external speakers. A high-speed USB 2.0 port allows you to quickly transfer your audio files to your Mac or Windows computer. The H1n works as a class-compliant interface with your computer, recording audio at 44.1 or 48 kHz sample rates and 16-bit resolution, straight to your DAW. The Polsen MO-PL1 is an omnidirectional lavalier microphone that delivers high-quality audio for mobile devices. The microphone's sensitivity has been optimized for iPhone, iPad, and iPod touch devices, thus providing proper signal levels, resulting in a significant improvement in the audio quality of your recordings. The MO-PL1 is also impedance matched to ensure compatibility with your mobile device. The mic enables the voice to be "up front" even when recording video from a distance. The included tie clip discreetly hides the microphone and provides hands-free simplicity during presentations or interviews. Easy to use with no batteries or power supply needed, the MO-PL1 works with many audio and video recording apps to capture clear and natural sound for lectures, dictations, and online videos. The omnidirectional polar pattern provides excellent off-axis response even if the subject's head turns while speaking. The 12-foot cable provides the flexibility of getting longer-distance camera shots with up-close audio. The MO-PL1 is an excellent tool for recording professional-quality sound on mobile devices. The SC3 3.5mm TRRS to TRS Adapter for smartLav from Rode allows you to connect the output of your smartLav microphone to a 3.5mm TRS equipped device, such as a camera or audio recorder. It features color coded, gold-plated connectors, with gray indicating the TRRS input, in addition to shielded construction. Box Dimensions (LxWxH) 8.6 x 4.3 x 1.7"
Box Dimensions (LxWxH) 5.512 x 2.598 x 1.339"
Box Dimensions (LxWxH) 3.1 x 2.9 x 1.1"
I just purchased Zoom H1n. What In-Ear-Monitor impedance rating(ohms)should I use? The H1n has a rated output level of 20 mW + 20 mW into 32&Omega;.